With its rich flavor and tender meat, goose is perfect for your holiday feast and, with a few roast goose recipes on hand, your dinner will be even more memorable. One of my favorite Thanksgiving memories is of a dinner I had at a friend's house. His family were the kind of people who did everything from scratch including the cranberry sauce, which I did not recognize as such because it didn't have the little ridges from the can. The kids actually had plates they had painted at a local color-your-own-plate store. Sitting there drinking local wine that was embarrassingly better than I was used to drinking and listening to songs from a radical but pleasantly mellow radio station from the far end of the dial, I knew I was in for a fantastic holiday experience. As the dinner progressed through familiar courses of unfamiliar food, I started to envy my friends and their adventurous palates. The soup was a thistle soup. The salad had dandelions in it, a unique addition at a time when wild lettuces were not readily available in plastic bags at the supermarket. When the bird was brought out from the kitchen, golden brown and aromatic, it looked markedly different from what I had expected. Rather than a large hulking beast of a bird, it was a somewhat more sleek looking fowl. It was, in fact, a goose. Geese, like ducks, have a layer of fat under their skin that you won't find on your typical chicken or turkey. This fat layer is what makes the goose tender, rich, and flavorful. But if the goose isn't prepared properly, that fat layer can make the skin rubbery and greasy. 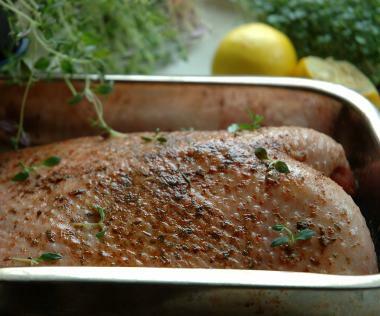 Most good roast goose recipes will advise you to poke holes in the skin so that the fat can drain as the goose cooks. This is a good idea, but I have found that going just one step further gives a better result. When you poke holes in the skin, go into the fat layer but not all the way down into the flesh of the bird. About a quarter of an inch deep will work best. For this roast goose recipe, I like to use a roasting fork to poke the holes, but you can use a skewer if you like. I wouldn't advise using a knife because we want to perforate the skin not slash it. We want to focus mostly on the breast and thighs of the bird where the most fat will be found. Once the skin is perforated, we will need to immerse the goose into a pot of boiling water. If you have a pot large enough to fit the whole goose, then you can just keep it under the boiling water for about two minutes. If you have a smaller pot, you will need to immerse the breast for two minutes and then turn the bird over. Then place the goose on a clean plate and leave it uncovered in the refrigerator overnight. The cool air of the refrigerator will help to dry the skin out. If at all possible, do this two days before you plan to cook the goose. A 6-10 pound goose will feed about 6 people. You can stuff it with your favorite stuffing recipe. I have found that a fruit-based stuffing is best with the rich goose taste, but traditional corn bread stuffing works well also. Make sure the goose is thoroughly thawed. Using a skewer or a roasting fork, poke several holes in the skin about 1/4 inch deep. Try your best to avoid hitting the flesh. Be sure to make plenty of holes on the breast and thighs of the bird. Using the largest pot you have, boil enough water to immerse the goose. Boil the goose for no more than two minutes. Remove from the water and dry the skin. Place in the refrigerator overnight, for 48 hours if possible. Salt and pepper the goose inside and out. Place the goose, breast side down, on a roasting rack in a roasting pan. Prick the exposed skin and cook for another 20 minutes. Turn the goose breast side up. Baste the goose with the pan juices. Roast for another hour, basting every 15 -20 minutes. If the goose is very brown at this point, just let it cook for another 30 minutes. If the goose is looking a little pale, crank the oven up to 400 degrees Fahrenheit and cook for 30 more minutes. The bird is done when your instant read thermometer reads 180 degrees.